PCD Pharma Franchise for Nutraceutical Drugs – Over the past few years, the increase in the demand of dietary supplements has been noticed. Since these supplements help in preventing diseases, the demand for nutraceutical drugs is expected to grow in the upcoming years. Biofield Pharma is the prominent pharma franchise company that provides a broad range of medicines that cover ortho range, pediatric range, general range and gynae range. We provide the PCD Pharma Franchise for Nutraceutical drugs or dietary supplements throughout India. Dietary supplements are available in the form of tablets, capsules and liquids. Dietary supplement has shooted high in demand due to people becoming more conscious about health and fitness. Owning a business here surely means earning big. Biofield Pharma is among the top most pharmaceutical companies that are engaged in formulating innovative and effective dietary drug solutions. Our company offers the monopoly-based PCD Pharma Franchise for Nutraceutical drugs. As well as it facilitates its associators with marketing and promotional tools. 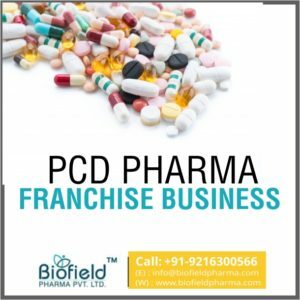 What are Nutraceutical Products and its Scope for PCD Pharma Franchise? The word nutraceutical is combined with the word nutrition and pharmaceutical. Nutraceutical product is a food product that not only supplements the diet but also assists in treating or preventing disease and provides medical benefits. These have also been called medical foods, designer foods, phytochemicals, functional foods and nutritional supplements. The nutraceutical ingredients include pre-biotic and pro-biotic vitamins, minerals, fibres, proteins, omega 3 and structured lipids, amino acids and various other ingredients. The key to managing health as per the consumer’s view of nutritional products is driving the global nutraceutical industry. A valuation of USD 383.06 billion in 2017 was made for Global nutraceutical market which expects to touch USD 561.38 billion by 2023, at a CAGR of 6.8% from 2018 to 2023. So, a good scope of economic growth in PCD Pharma franchise for nutraceutical products can be expected. All the products being offered here are certified by the Food and Drug Administration (FDA) and approval from DCGI. We use the best quality raw material for the manufacturing of our products. All these features make us capable of serving people with our quality medicines. A wide range of medicines allows us to give the opportunity for PCD pharma franchise. We ensure a reliable market support for better business growth. The pharma franchise associates will get the best support and ethical business opportunity while working with us. The supplement drug market is a great demand segment to do a business. Our Associates rely on us for quality and innovative products. We have won the trust of health professional with our high standard quality products. Here given below are some benefits of choosing Biofield Pharma for Pharma Franchise. High-Quality products manufactured by international standards. We are dedicated for the customer satisfaction with quality product and services. The company believes in transparent and ethical deals with its associates that make us best among others. Join us and make your franchise business bright with nutraceutical medicines.